In her first public appearance since her stunning loss to Donald Trump, Hillary Clinton urged supporters "not to give up." Speaking at the Children's Defense Fund gala in Washington, D.C., on Wednesday night, Clinton spoke about how difficult the election results have been for her. 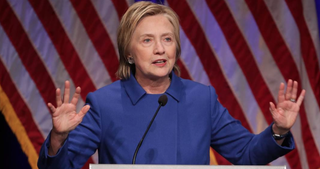 "I know many of you are deeply disappointed about the results of the election," she said at the event, which was scheduled before the election, NBC News reports. "I am, too, more than I can ever express." Clinton added that even appearing in public hasn't been the easiest thing. "There have been a few times this past week when all I wanted to do is just to curl up with a good book or our dogs and never leave the house again," she said. But Clinton, who was being honored by the Children's Defense Fund for "a lifetime of service," reminded guests that while she has been beaten, the fight is not over. "America is worth it. Our children are worth it," she said, NBC reports. "Believe in our country, fight for our values and never, ever give up." Clinton added that she wished she could go back in time to tell her mother of all she would become.